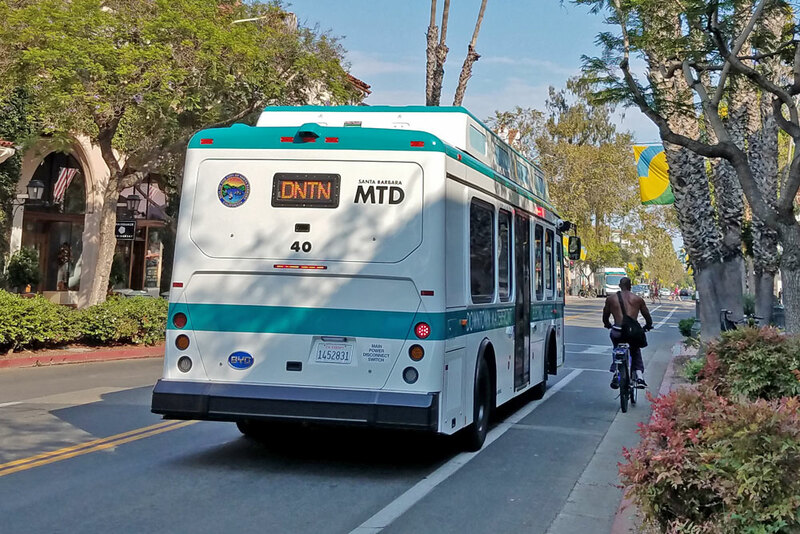 Faced with a gradual decline in ridership, the Santa Barbara Metropolitan Transit District is looking to launch a 1-day pass for people who ride the Downtown-Waterfront Shuttle. Rideship on the shuttle dropped 12 percent in fiscal year 2018, compared to the prior year, part of an overal decline in bus ridership the past several years. "We're not thrilled about that," said Steve Maas, manager of MTD’s government relations and compliance. MTD plans to launch the 1-day pass in late September for $1. If you buy the pass, you can ride the bus an unlimited amount of time during a single day. The number of annual passengers on Santa Barbara’s Downtown-Waterfront Electric Shuttle has dropped by more than 200,000 since 2009. In addition, the number of revenue hours of service decreased 3.3 percent from fiscal year 2017 to fiscal year 2018. The average number of riders per revenue hour has also declined, from 23.2 percent to 21.1 percent. MTD blames the drop in ridership on several factors, including congestion today that didn't exist a decade ago. For example, a round trip from the Dolphin Fountain on Cabrillo Boulevard at the base of Stearns Wharf to Sola Street used to take about 30-35 minutes, but now a round trip can take up to 45 minutes during peak traffic times. In adddition, MTD last year deleted a 9 a.m. to 10 a.m. ride service that averaged about 40 patrons a day. It cost 50 cents to ride the shuttle and 25 cents for seniors 62 and older and people with disabilities. Maas believes that the new pass will help boost ridership. "We think this could work not only for tourists, but also for locals," Maas said. The service operates along State Street, from Sola to Cabrillo Boulevard, and between Cabrillo Boulevard and the Zoo in one direction, and the harbor to the other. MTD recently purchased 14 new electric buses to replace others in its fleet, which were built nearly 20 years ago. The new buses are longer and have air conditioning. "They can go faster and longer without being recharged," said Transportation and Circulation Commisson member Susan Horne. They also come with real-time technology tracking that can be accessed on a smart phone. Commission member Kathleen Rodriguez said that she is a grandmother and loves the idea of a 1-day pass because she could go to multiple places for $1 in one day. "The 1-day pass seems terrific," Rodriguez said.